A Crystal Bed is a remarkable healing device that involves a combination of crystal therapy (lithotherapy) and color therapy (chromotherapy), both of which utilize spiritual healing. In addition, healing music is usually played during a session. Developed by one of the world's most extraordinary and renown healers, Joao Teixeira de Faria or John of God. It is utilized as an important healing modality at his clinic, the “Casa de Dom Inacio” in Abadinia Goias, Brazil. A crystal bed has 7 extremely clear and highly polished quartz crystals suspended approximately 12 inches above the client who is lying on a bed or massage table. Each of the quartz crystals has been cut to a specific frequency. Each crystal is aligned above one of the seven human energy centers or chakras. Colored lights, chosen to match the chakra colors, radiate light and energy through the crystals to each respective chakra, and shine on and off in certain rhythms to cleanse, balance, and align one’s energies. The individual receiving the session bathes in the energy, as he/she rests face-up with eyes closed, and arms and legs uncrossed. People from around the world report deep healing experiences that not only occur during the session, but continue afterward. As the color is transmitted through the crystal onto the corresponding chakra, the chakra is cleansed, energized, and brought into balance with all of the other chakras. This allows various aspects of oneself, whether it be mental, emotional, or physical, to be brought into balance. As these subtle energies are brought into balance, the body's own natural healing mechanisms are able to function as they were designed to. A Crystal Bed Healing cleanses, balances opens, and recharges the body's energy creating a deep relaxation. It is also a great preventative modality. In the end, we may not know exactly all the ways that it works, but we do know it does! What will I experience during my Crystal Bed Healing? People feel all manner of sensations during and after sessions - pressure, weight, lightness, heaviness, hot, cold, wind, tickling, tingling, and other various body sensations. The Crystal Session can evoke feelings of peace and serenity, and typically a very deep relaxation. Some people simply fall asleep and wake up feeling very refreshed and renewed. Others experience insights and release of specific personal issues and memories. Some may see/sense the entities who are helping them and may even receive messages from them. Many report feelings of warmth, movement, expansion, cleansing, or a feeling of being touched. Some people feel sensations of physical healing taking place, as they feel the presence of the healing spirits working directly on their physical bodies. Some experience a shift in awareness into a higher, more expanded, state of consciousness. Some float back into past lives, and some have a feeling of great attunement to spirit. The experience is totally individual and unique to each person and to each session. How do I prepare for my Crystal Bed Healing? You don’t need to do anything. In fact, leaving “doing” behind is ideal! Simply maintain an attitude of openness and receptivity. It is also helpful, but not essential, to contemplate before your session and create a specific intention or prayer of what you want help with (on any level: physical, emotional, mental, spiritual). You may also want to wear white clothing for your session, though it is not necessary. How is this John of God Crystal Bed a portal? The Entities give certain people permission to bring Crystal Beds back to their home country. Special instructions are given for installation and blessings by the Entities from the Casa are given as this unit functions as a link to the helping spirits of the Casa. 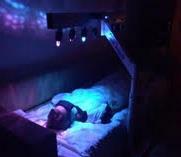 In addition to the healing power of the crystals and color therapy that the bed provides, the Healing Spirit Entities of the Casa are able to use this device as a portal so that they may more easily make their presence felt to those who seek their help in healing. The illuminated crystals create a portal that the entities can use to channel their healing energy to the individual receiving the Crystal Bed Healing. Typically what happens is that the crystals and lights first open, align and prepare the person in the beginning of the session so that the entities can then later in the session come in and make healing adjustments to the person's energy field and body. It's the combination of all these elements together that makes this crystal light therapy so special. Thus, those using the bed often receive healings from the Entities, spirit master doctors and their spiritual healing staff, or sometimes hear inner guidance from them. These Crystal Beds have been created as a way to extend of the work of these Entities. John of God is a spiritual healer in Abadiania, Brazil. Considered the world's most powerful unconscious (or full trance) Medium, Joao Teixeira de Faria, also known as John of God, channels over 40 “entities,” who, with their hosts of other beings, do the healing work. These highly evolved spirits or "entities" take over John of God’s body and perform miraculous healings while he is completely unconscious of what is happening. These healings can and do occur on any or all levels - whether spiritual, mental, emotional or physical. Dom Inacio, or Saint Ignatius of Loyola, is the patron spirit or "entity" who directs this healing work from the spiritual dimensions. John of God is a humble farmer who has devoted at least 3 days every week for 50 years to serving all in need - for free. He created a center in Abadiania, Brazil, the Casa de Dom Inacio de Loyola, where all people, of all religions and all countries, are welcome to receive physical and spiritual healing. Over 7 million people seeking distance healings and over 1 million people seeking in-person spiritual healings have come before the Spirit Doctors and John of God. An important foundation of John of God's spiritual philosophy comes from the gospel as he stresses the importance of forgiveness and Christ's message: "This is my commandment: Love one another as I have loved you." (from the gospel of John 15:12). Please plan to be on time. This way you can receive all the minutes you scheduled. We allow for 10 minutes in between sessions to allow time to properly put you on the bed and to help you get off the bed, however, if you are late, we cannot guarantee that you will get your full amount of time that you paid for. While at the Casa in Brazil in August 2013, Malaena went before John of God and was granted permission by the entities to purchase a crystal bed and bring it back to the United States. She also was able to bring the crystals that are used in this specific bed before John of God as he was incorporated by an entity of such great compassion that she was moved to tears and could hardly speak or move. The crystals were specifically blessed by the entities on this day. Providing an original Casa Crystal Bed outside of the confines of the Casa in Brazil brings the energy and healing vibration of the Casa to you. John of God personally guarantees the energy of the Crystal Bed and thinks of them as his children. In addition, Malaena carefully follows her own guidance from the entities in how to use the Crystal Bed and how to work with clients. She is honored to be able to serve you in this unique way, where you can receive the energy generated from this powerful healing tool without having to travel to Brazil. "I had the transformational experience of being called to John of God’s healing center in Abadiania, Brazil. I was in the middle of giving an Atlas Balancing session and out of nowhere I heard a voice that said, ;It’s time now for you to go to John of God.' Less than 3 weeks later I was in Brazil receiving profound healing on multiple levels. I even had a spiritual surgery in an area of my body that I was not aware needed attention! The reason I know this is because after surgery, I was lying in bed in great pain in my arm and breast (which had never hurt before) until I asked the benevolent entities (doctors and saints) to 'anesthetize' me. Shortly thereafter I was 'knocked out.' I almost slept for an entire 24 hours. I was only awake to go to the bathroom and eat and for that short stint of pain. The whole experience of being in the beautiful energy vortex of John of God was deeply rejuvenating, heart-felt, and uplifting; and it brought me to the deepest, most grounded, level of faith that I think I have ever known. One day while lying in a crystal bed in Brazil, I heard an inner voice that told me I could (and should in fact) buy a crystal bed. I was told the exact amount that it cost. I had no idea that one could purchase such an extraordinary device! I inquired and found out that you could indeed, with permission of the entities...and now, with tremendous love and gratitude in my heart, I feel honored to offer you the experience of the energies of this 'Heaven on Earth' that I have been so fortunate to discover. Take a moment to ask if you are being guided to experience these healing energies that will stay with you long after your session... with Love, Malaena"
How is a Crystal Bed Healing treatment conducted? A Crystal Bed Healing is safe and non-invasive. The person receiving the Crystal Bed Healing simply removes their shoes, and glasses and then lies fully clothed below the suspended crystals, so that each of the seven crystal aligns to the their corresponding chakra. (There is somebody to help with this.) Once the person is comfortable, a cloth is placed over their eyes. The lights in the room are dimmed, soft music is turned on, and finally the pulsating lights shining through the crystals are turned on. All the individual needs to do is relax, let go, or even fall sleep. Some like to say a prayer and/or state their gratitude and intent to the entities. After this, it is best the person just “let go and let God/Goddess”. The light, the crystals, and the healing spirit beings will do the rest. What do I do after a Crystal Bed Healing? No matter what the experience, it is advisable for you to rest after a Crystal Bed Healing session in order to fully absorb the experience. It is also recommended to drink several glasses of water over the next several hours (and even days) to help rid the body of any toxins or waste products which tend to be released through the cleansing action of the Crystal Healing. It also can be helpful to write down the experiences and guidance which can occur during the healing session, to help integrate and ground the experience into your life. What longer-term effects can I expect after my "Crystal Bed Healing" Session? As with many of Subtle Energy Healing Therapies, the FDA states no claims can be made that any disease states can be cured. Many, many reports of personal healings occurring daily throughout the world with medical validation. Healing can occur on many different levels, spiritual, mental, emotional, and physical. The Crystal Bed also can help open the connection with the Healing Spirit Guides.